When I was in high school, one of the electives available was financial accounting. As my boys approach high school age, I figured I’d be developing my own course, probably using a college textbook. Well, thanks to Michael P. Licata, Ph.D. of Professor in a Box, homeschoolers no longer have to do that. Why accounting? Obviously, if you dream of becoming a CPA (as I was, once upon a time), accounting is necessary. It is required in any business degree. Accounting is more than being a bean counter though, and having some knowledge of the basic 'language of business' is useful for anyone who plans to be an entrepreneur, or even someone who plans to select investment options in their employer's 401K plan. This course is at college level, but any student who has completed basic algebra skills should be able to handle it. It is set up in 28 lessons, which could be done as a full year course, a semester course (like it would be in college) of 2 lessons per week, or even as a summer school course at a pace of 3 lessons per week. I would NOT recommend that accelerated of a pace for most high school students though, as it would be quite a load. Professor Licata, a homeschool dad, is used to teaching college students (at Villanova University in Pennsylvania), and this course is set up in a typical college format. You have a syllabus, a lesson plan, and the coursework is pretty much one part lecture (via slides and audio) and two or three parts working out the homework problems (using spreadsheets for virtually all of it). After completing the course, the student should be prepared to sit for the new Financial Accounting CLEP exam. The final exam in this course is an excellent preparation for the CLEP exam, from what I can tell. Connor is used to a bit flashier presentation of materials, so I really did need to make sure he could watch the lectures when there weren't the usual number of distractions. He had to work to stay focused, and younger siblings made that extremely difficult. He was able to follow along quite well though, if they weren't in the room. You can check out a sample chapter here. Let's get back to the presentation and format though. This really is set up like a college course. There is little fluff, and it is not "entertaining" as such. Don't get me wrong, I would imagine Professor Licata is a very well-liked professor. His examples tend to be relevant to kids -- a store that sells new and used CDs, for instance. But he isn't telling jokes or having the kids play with manipulatives of whatever sort. No accounting vocabulary hangman for a few extra points. It gets to the point. I think a motivated 9th or 10th grader could handle the course. I think most students would be best off taking it in later in high school though. As for the content, I highly recommend this. It is a thorough course, far more complete than what I had in high school. 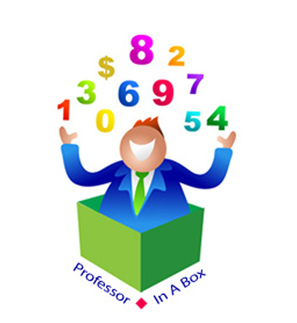 I'm hoping that Professor in a Box will come out with more courses for the homeschooled high school student... Financial Accounting II? Managerial Accounting? I'm very impressed. Connor's opinion? Keep in mind he is only 12... this isn't his favorite class. He likes hearing Mr. Demme's jokes in Geometry, and he likes playing Battleship while reviewing Roman kings. However, he is also appreciating the fact that he isn't wasting time on activities that have little to do with the subject he is supposed to be learning. He isn't having to videotape a public service announcement about when to recognize expenses, for instance. He's working out realistic problems in a fairly true-to-life way. And that is different from almost everything else he sees in his school day. Our plan is to continue with the course, at the full-year pace (especially now that both desktops are working), assuming it continues to go well. When Connor finishes the course, he will sit for the CLEP test. If he does get overwhelmed with the content, we'll set the course aside for awhile, and come back to it when he is a bit older. I will certainly post about how he does on the CLEP, as I assume he will be taking that around June. My recommendation? Once your child has completed Algebra I, I would seriously consider this course. If your child is college-bound, this course is a great way to introduce basic college-level expectations. I would not necessarily rush into it, though. But if you are at a point where you are considering things like CLEP exams, I think this would be a terrific way to start. The course is non-consumable (except for the pencil), so you can use it with all the kids, assuming no major changes to GAAP (generally accepted accounting principles) in the meantime. Those don't change significantly all that often, so you will probably be fine. If your student is not college bound, I would still consider this pretty strongly in later high school. For one thing, taking the CLEP means that they can now check off "some college" instead of "high school degree" when asked about education! More importantly, though, whatever they are going to do as adults, it will certainly at least occasionally involve forays into business at some level -- and understanding the language is certainly a plus. Right now, the course is available for $134.99, which includes shipping. The course consists of an instructor CD (with pdfs of the syllabus and course schedule, the templates for the chapter problems, the tests, etc. ), three disks that contain the lectures and notes, a pencil and a calculator. For my family, that is $27 per child, plus a CLEP fee, to earn college credit in Financial Accounting *and* to get used to what a college course is like. Disclaimer: As part of the TOS Homeschool Review Crew, I did receive this accounting course for free from Professor in a Box. The fact that I received a complimentary product does not guarantee a favorable review. It does guarantee a review. A fair review. But I am not going to praise something unless I think it deserves the praise. If I don't like it, you'll hear that. And hopefully with enough detail as to why so you can decide for yourself if what I hate about it makes it perfect for your family. For more about my take on reviews, visit my blog post here. Anyway, that was a really great review! I come across some curriculum reviews out there that are phoned in, but yours are very thorough and I really appreciate it.